More than 50% of the world population are female. These figures are not reflected in the gender distribution of property owners, in many countries there are even not more than a very small percentage of female land owners due to legal restrictions or cultural traditions. Holding property on land is linked to fundamental rights for daily life in many places and cultures, e.g. access to drinking water, access to public services via taxes, participation in decision processes e.a. Women representing a minority among land owners are subsequently a minority in claiming their rights for their own lives. to adapt the profession to changed profiles and thus secure the existence. The following scheme gives an overview about major changes which have occurred to the profession during the last ten years. The new profile of the profession opens facilities to raise interest to women for the profession and to overcome obstacles that might have prevented women from getting into the surveying profession. The former outline of the profession combined with a lack of promotion for technical skills has been a deterrent to possible female students. Working in some specific fields of the profession created difficulties to reconcile profession with family due to long-term field working periods or necessary permanent residence in case of specific technical measurements in site. Additionally there were a lot of prejudices spread by a majority of male professionals for female incomers to overcome. As in most other professions it is important for any underrepresented group to take over an active role and to change the situation by professional means. Surveying has changed from a more manual profession to a high-level IT profession with new methods to replace the former physical skills by mental and organisational skills. Service replaces production. The entire former subjects of the profession form now the core of the changed scheme with various new topics added to it. Incoming related professions offer a big variety of activities that help to keep the profession vital and focussed to future demands. Information Technology, marketing, communication, promoting, consulting, empathy for clients, sensibility for what can be done will be recommended skills – soft skills that are mainly obtained and traditionally well practised by women. If women succeed to qualify for these new activities by selecting specific curricula and continuing post-graduate training with focus on these topics they will be able to develop leadership. They will find a real chance first to get into technical professions and second to support women's personal rights as land owners and property holders and therefore will help to strengthen women's personal situation. If women will be able to fill the gap, they will not only improve their representation but also play a leading role. Chances have never been better as now for women to contribute to the surveying profession and help to build up a profession which plays an important role in the global and local market representing the interests of both genders according to the proportion in the population – which is to say fifty-fifty. Patricia “Gail” Oliver is a Professional Surveyor and Mapper licensed to practice in the State of Florida, USA. She has over 23 years of experience. In March 1979, after graduating from the First Coast Technical Institute with a Diploma in Drafting and Design – Cartography, she began her career with The Deltona Corporation at their St. Augustine Shores Development as a drafter/rodman. Since that time she worked for Charles Bassett & Associates, Inc. and Crosscheck, Inc., both located in Jacksonville, Florida. Gail attributes her career being on the fast track to being in the right place at the right time. She had the opportunity to participate in some high profile projects with groundbreaking technology and approaches in her early years with Charles Bassett & Associates, Inc. Gail has extensive experience in most aspects of surveying, including Boundary, Platting, Topographic, Mean High Water, Rights-of-Way, Hydrographic, and Geodetic Surveys. Gail had not always planned to be a surveyor. In 1977, at the age of 17 years, she decided to transfer from Catholic high school and a very structured environment to the First Coast Technical Institute. She tried to enroll in bookkeeping/secretarial studies, but those classes were full. Her advisor said the only studies with openings were in the drafting and design discipline. Reluctantly, Gail enrolled, thinking maybe she’d eventually become an architect. Her mentor, Mr. Frank Willie, took her under his wing and guided her towards surveying since he immediately recognized her mathematics skills. From that point forward Gail fell in love with the profession and all it represented. Having always had a straightforward approach, “can do” attitude, and the ability to get along with people, she excelled. In 1993, her career in the private sector ended as a result of her mother being diagnosed with cancer and the demands of raising a family. The difficult decision was made to enter the world of government employment that offered forty hour work weeks, sick time, vacation time, insurance and retirement benefits. Again on the fast track, Gail worked her way from engineering technician in 1993 to County Surveyor for St. Johns County, Florida in 1995. As County Surveyor, Gail oversees the GIS and Survey Divisions. St. Johns County being one of only two Florida counties where the GIS Division reports directly to the County Surveyor. As County Surveyor, one of the duties is to review proposed record plats that will eventually be recorded in the public records. Doing these reviews earned Gail an invite to participate on a state committee to rewrite platting laws. Participation on this committee then propelled her into being appointed by the Governor of Florida to the state regulatory board for professional surveyors. Gail served eight years on this board, along with becoming active on a national level in the American Congress on Surveying and Mapping, National Society of Professional Surveyors (NSPS), National Association of County Surveyors, and the National Council of Examiners for Engineering and Surveying (NCEES). Having just completed a two year term as Chair of the NSPS Forum for Equal Opportunity and completing task force work on the NCEES Model Law for Surveying, Gail has just been elected as President-Elect of the National Association of County Surveyors. She will be the first female president of the organization. Gail is married to Mike Oliver for seventeen years and has a twenty-one year old daughter and a twenty-three year old stepdaughter. She also has two cats and a dog and loves the outdoors. 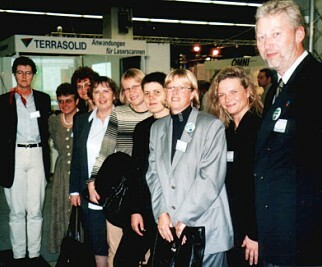 After first activities in FIG about the subject „Women in Surveying“ in 1989 a Working Group was founded in the DVW with the name „Frauen im Vermessungswesen (Women in Surveying), AG FiV“. This working group was not integrated in the structures of the association, but since 1995 the AG FiV got the same financial support like the 9 national Commissions in DVW. In 2002 the General Assembly of DVW decided, that the Working Group is terminated by the end of 2002. The autonomy of the group will get lost but with the new period starting January 2003 the work will be integrated under the title “Frauen im DVW (Women in DVW)” in the new national Commission I (Commission 1 and 2 in FIG) and the financial support will be the same as before. Gabriele Dasse, Chair of the Working Group, and Angelika Schuchardt, Vice-Chair of the Working Group, are members of that new DVW Commission I and it is their hope that the concerns of women in surveying won’t get lost. In the moment the AG FiV has 57 members, from all over the country and from all fields of the profession. 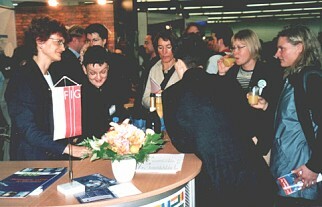 During the last annual national congress INTERGEO in Frankfurt in October 2002, the AG FiV was present at the booth of the DVW. The goal was to contact colleagues and to inform about the activities of the working group. The meeting of AG FiV held during the INTERGEO on October 17 was very well attended. 20 members of AG FiV participated. DVW Vice-President Dr. Thöne informed about the new structures of DVW and the changes for AG FiV. And among other things there was a report about a seminar organized by AG FiV about career planning. The meeting was proceeded at the booth of DVW. DVW Vice-President Dr. Karl-Friedrich Thöne with members of AG FiV: Jennifer Maldar, Gabriele Dasse (Chair of AG FiV), Birgit Bannert, Susanne Klinke, Regine Martin, Angelika Schuchardt (Vice-Chair of AG FiV), Katja Zoll (Vice-Chair of AG FiV), Elke Schultze-Graf. The “Women in DVW” will meet 4. – 6. 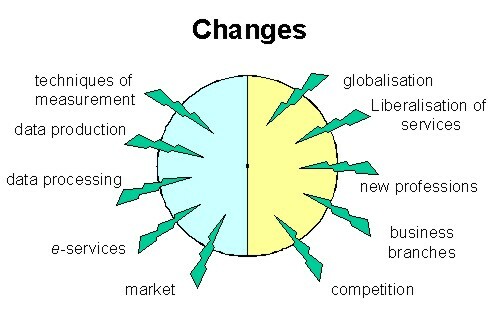 April 2003 in order to organise the next activities. Subjects will be the exchange of experiences concerning professional situations and careers, revision of the internet sites and recruitment of young people for the surveying profession. 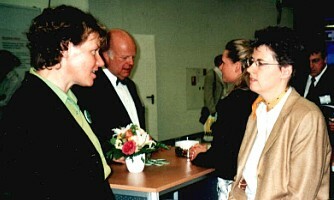 In 2002 fourteen women participated and had a work-filled but successful and interesting weekend. © Copyright 2003 Gabriele Dasse.